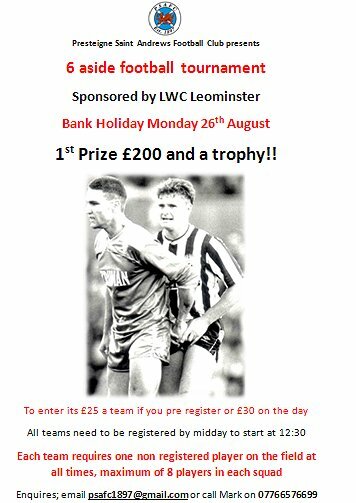 Presteigne St Andrews FC is to hold a six-a-side competition Bank Holiday Monday – 26 August – and they are looking for teams to enter. Mark Weiland and Andrew Williams are organising the event and they are keen to get things up and running as soon as possible. It will certainly be worth teams taking part – there will be a £200.00 first prize, as well as trophies for the winning team and the organisers are looking for teams to book in advance if at all possible. You can email Mark and Andrew by clicking here or by contacting any club official. 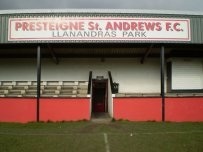 The entry fee for teams will be £25.00 if they pre-register, or £30.00 if they enter at Llanandras Park on the day. Each team will require one non-registered player on the field at all times and teams are allowed to register teams of eight players. So, get your squad together and get your entry into Drewe or Weedo as soon as possible – complete with your entry fee and list of players.